Simple quirky songs with an otherworldly vibe combine with low fidelity rock/punk music, distorted vocals, and raw performances to create a unique humor filled experience. "I am a fan of low fidelity trashy music with distorted vocals" says one TAXI screener who declined to be named. He instantly "got" that this band's appeal is in their lack of polish and their simple quirky songs. 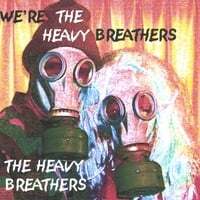 The Heavy Breathers have an otherworldly vibe but are really a pair of simple minded musicians who are losing it together but having fun along the way. They believe that if a song smells it sells, so they know their songs will be a big hit! I love The Heavy Breathers! WOW! I have just discovered The Heavy Breathers and I have to say that I'm truly AMAZED! Your unique sound and profound lyrics is what I live for! Rock on! Keep up the good work and PLEASE come to Sweden! !